New Yorkers have a strong affinity for Halloween festivities, with the Greenwich Village Halloween Parade drawing spectators from around the world annually. Come the end of October, New York City looks a bit like the Ghostbuster’s ghost containment facility got shut down, unleashing frights on Manhattan. Contributing to the eeriness, New York theatres begin to fill with productions featuring all things grim and sinister. 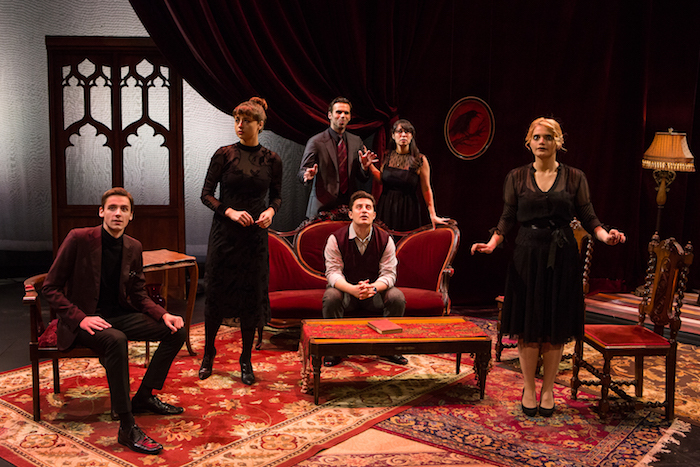 Amongst the offerings this year is Fengar Gael’s gothic tale The House on Poe Street, which finds humor in the macabre and tackles social issues in a spooky setting. While it is delightful to spend time with some of Gael’s quirky and oddly alluring characters, The House on Poe Street is at its best when reveling in the bizarre and supernatural and begins to meander only in its attempt to be socially relevant – spreading itself thin in discussions of privilege. In The House on Poe Street, Mendel Steingold, a young and privileged real estate attorney, visits twin sisters Argonne and Flourine Seaborg to deliver their recently deceased mother’s will and the deed to her darkened New York estate – an estate rumored to be former home of Edgar Allen Poe and the place where the melancholy man penned The Raven. The twins quickly unsettle Mendel, revealing to him that their mother modified their genes before birth, which gave them uncanny eidetic memories and altered their biology in other surprising ways. While this disturbs Mendel, it is the late Mrs. Seaborg’s goal of identifying and suppressing the warrior gene that angers Mendel who likens her experiments to eliminate male anger and aggression to chemical castration. The twins assure Mendel that they do not care to continue their mothers work and are much more interested in transforming their new home into an Edgar Allen Poe museum. Mendel’s finance and friends soon grow enamored with the idiosyncratic twins, enjoying their musical melodies and joining a seance in the old home to summon the ghostly presence that appears to be inhabiting its walls. But, all is not as it seems in the Seaborg homestead and the entire group finds its conceptions, beliefs and opinions challenged both by the otherworldly and by the socio politics of their positions in society. The splendidly peculiar Argonne and Flourine are two of the most bewitching characters I have seen in recent theatre. Simultaneously disturbing and riotous, Gael has crafted two characters who are intoxicating in their paradox. An air of comfortable disquiet laces their words. An uneasy joviality pervades the air. Their words and graces are charming yet off-putting. I could spend days with the Seaborgs and never get bored. The pair flourishes in Gael’s gothic setting, at home amongst the ghosts and skeletons of the past but not of them. In many ways, the very real advancements of the Seaborg women are perhaps more shocking and unbelievable than the spirits inhabiting the old homestead. Where Gael’s narrative loses focus is in its attempt to thrust realizations upon yuppie Mendel. Mendel and his fiancé have a significant falling out after he discloses his investments in weapons and war materials, which the twins elicit while presenting their argument for continuing their mother’s research. Rather than continuing to debate the moral, legal or ethical considerations involved with such eugenics, the discussion refocuses on Mendel’s possible indirect funding of devices that are used in war – leading to his eventual resignation from his investment club. * It is an unfortunate pivot from a truly engaging argument, as if Gael is not quite prepared to wrestle with the thornier issues pervading the tale. Moreover, Mendel and the other characters in the show fail mightily to stand up to the glorious creations that are Argonne and Flourine. Mendel has little dimension yet he narrates The House on Poe Street, effectively sanitizing the whole play through his banal gaze. Atmosphere can be difficult to create on a small production budget, but Pei-Wen Huang-Shea’s foreboding set design transforms the space into a shadowy rundown loft, with Poe-inspired accents and phantasmal touches that transport the audience into an unsettling environment. Isaac Weisselberg’s lighting design compliments and accentuates the set design, highlighting key elements of the set while shrouding the rest in darkness. Alice Giacconi’s costume choices for the twins echo back to the 1800s but incorporate enough modern touches that Argonne and Flourine look both natural in the modern setting and slightly out of place, befitting their characters. Much of the cast of The House on Poe Street flounders to find their characters, latching onto moments of exaggerated acting to compensate for their peripheral roles in the play. Gregory Jensen makes the most of the few moments in the play that permit him to break free from the mundaneness of the part of Mendel (a brief scene of possession is both hilarious and disconcerting), yet these moments are few and far between. Richarda Abrams is a scene stealer as medium Lithia Nickels whose methods are, shall we say, exuberant to the point of farce, much to the audience’s delight. However, the true stars of this cast are Olivia Nice and Eliza Shea as Argonne and Flourine Seaborg. Believable as close sisters, the duo plays well off of one another – with Nice’s authoritative and collected demeanor complimenting Shea’s quirky and bright-eyed unabashedness. Both have beautifully harmonious voices and impeccable comedic timing, and I can only hope that I have an opportunity to see them on stage again soon. As a Halloween show, The House on Poe Street contains enough unsettled spirits and disquieting dialogue to make audiences both tremble with unease and ponder difficult questions about human nature and the lengths to which we can and should go to achieve social harmony. It is only when the playwright drifts away from the Poe-inspired plot and the lives of Argonne and Flourine Seaborg that the show stumbles. *Because apparently Mendel has never heard of socially responsible investing. The Leftovers: B.J. And The A.C.
Star Wars: Battlefront Beta – the game you’re looking for?